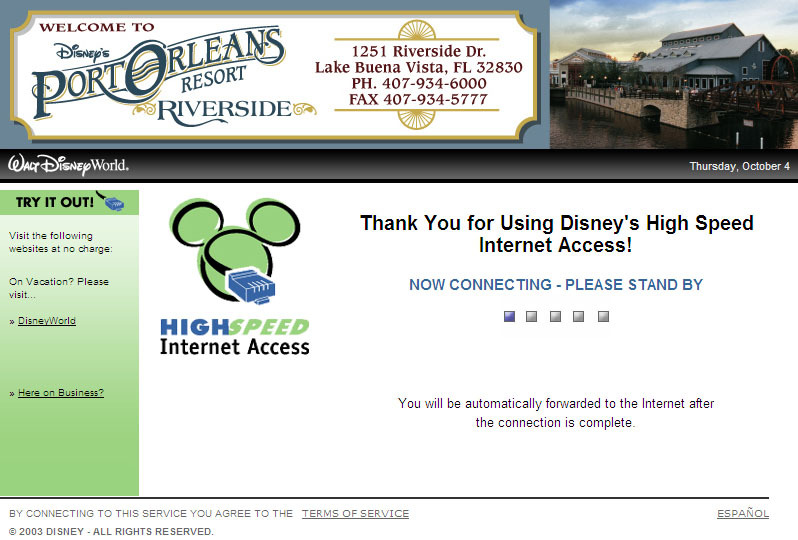 On Thursday 15 December 2011, Port Orleans Riverside and Port Orleans French Quarter launched a new free wireless internet service for guests. Free wi-fi access is now available in all guest rooms, plus the main public areas — lobby, restaurants, shops, arcades, areas surrounding the feature swimming pools, bus stops and Porte-Cochère. To sign up from your room, simply look for the open wireless access point named “In-room Guest WiFi (Disney)” (changed from “guest-wireless” in October 2012) and connect to it; no password is needed. 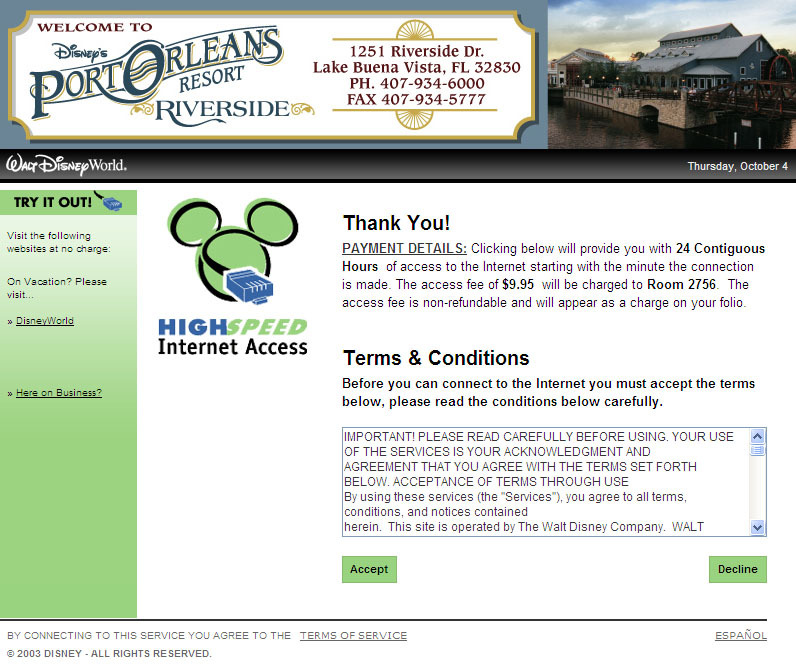 Your browser will initially ask you to accept Disney’s Terms & Conditions, and once you’ve agreed you should have wireless internet access on that device for the next 24 hours. You will need to re-confirm the T&Cs again each 24 hours, but otherwise there are no restrictions on how long you can use the service. The lobby and other public areas use a different wi-fi access point name, “Public Space Guest WiFi (Disney)” (was “Disney-Guest”, which was the same service name that is used in the theme parks). Again, it is free and open but you must accept the Terms & Conditions page the first time you connect to it each day. Speed is sufficient for basic web browsing, but any sort of video or even audio streaming, or photo/video uploads, might struggle. 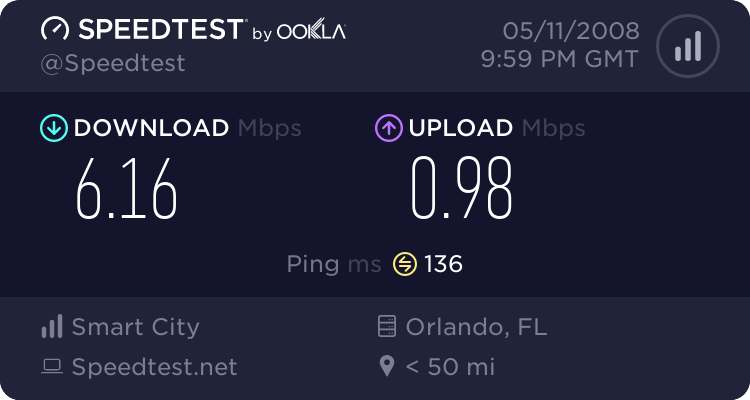 Several in-room tests have indicated a 1 Mbps download rate, but just ¼ Mbps (256kbps) upload — although you should be able to get better rates in the public areas and theme parks where the speed is generally around 3-4Mbps. Update 2-Feb-2013: It looks like the in-room speed may have been increased to 3Mbps, which is a very welcome change! You may find that leaving the wi-fi connection area (or turning your wi-fi off) and then returning to use it again later the same day will ask you to accept the T&Cs again, which should not happen and can get quite annoying after a bit. For any access problems, dial 56 from any room phone to contact the Internet Access Guest Support team, or call 1-407-827-2732 or 1-407-827-WiFi (407-827-9434). Note: The following information is for historical reference only. The wired internet access facility is no longer provided. 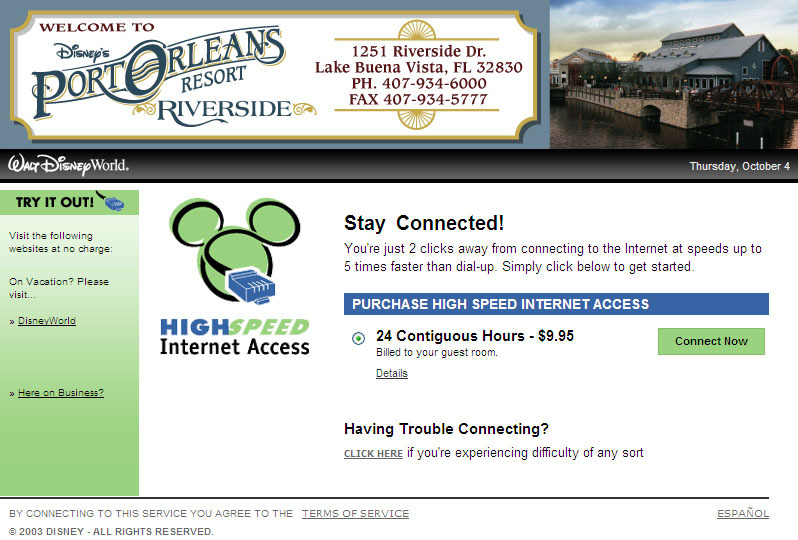 At Port Orleans, the HSIA (High Speed Internet Access) ethernet socket is located on a flying lead either next to the table by the window or on the bedside table. There should be a short ethernet cable provided in the room which can be used to connect virtually any modern PC or router. This cable used to be found in a little bag hanging on the clothes rail but most rooms now seem to have the cable already connected to the floating socket ready for you to pull it out. Don’t lose it or take it home by mistake though, or Disney will charge you $10 for it. When the access period expires, you will see the login page again and can pay for a further 24-hours whenever you like. To get the most from the service it’s probably best to subscribe around the middle of the day so that you can get access all that afternoon/evening and also the following morning. If you have any problems, Technical Support is available 24 hours a day by touching ‘56’ on your in-room telephone or by dialling 1-407-938-HELP from outside Disney. Also, watch out for inactivity timeouts. Rather than connecting you to an in-house network for 24 hours as you might perhaps expect, the service is just like many home broadband modems and the link drops after a period of inactivity. Of course, it does reconnect automatically when you next request a web page, but the temporary “forwarding” message while this happens can mess up some activity — such as posting a message which just took you half an hour to compose on your favourite Disney forum for example. ’Nuff said. 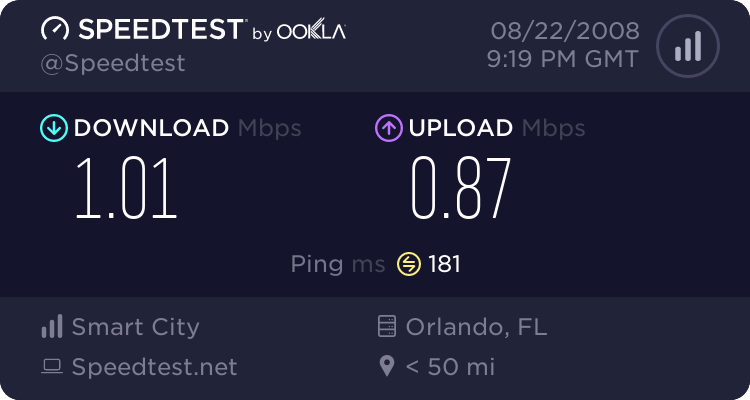 If you don’t want to pay $10 for high-speed access but just want to check a few emails every couple of days, the Port Orleans room telephones have a data socket on the side to which you can attach your own modem cable. Assuming you have a suitably equipped computer and an account with a dial-up internet provider, you can call your ISP’s local or toll-free access number by prefixing the normal dial string with the digit ‘8’ to get an outside line — e.g. 8-1-800-555-1234.